Get comfortable in your chair, take a deep breath, and say hello to your body. How do you feel? Settle in, close your eyes, and notice your entire body, especially your skin. Notice your size- how does it feel? Notice your 1st chakra and the center of the planet, and send a hello to the two points. Create a grounding cord and connect. How does your body feel to connect and release energy? Bring your awareness to your body again. Notice your “space”- your space is your aura. Become aware of this energy around you, feel its size, imagine a bubble of energy under your feet, over your head, behind you, in front of you. What happens to your body when you notice this space, your aura? How do you feel? Continue to stay aware of your grounding cord. You can carry negative and foreign energy in your aura, too. Release any negative and foreign energy from your aura, (you don’t need to identify it) just release it, and let it go. Take a deep breathe. Now, notice your room – take your aura, and extend it to fill up the room. How does that feel? Sometimes your aura is big, sometimes it’s small- do you feel you lose a sense of yourself, if you extend it too big? Now, extend it to encompass the building- how does that feel? Are you comfortable doing this? If it feels uncomfortable, try it anyway, just for the experience. 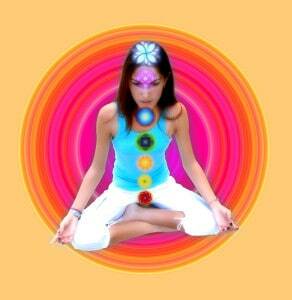 Now bring your aura back to the room, then back to your body, about two feet around your body. Next, pull it in another foot, then pull it in to six inches. How does that feel? Do you feel like you don’t have enough space? Now bring it back to about two feet. Find a comfortable place. Sometimes just moving your aura around shakes out the alien and negative energy. Notice your grounding cord, and continue to release energy. Now, get the idea of “owning” your space- in the owning and creating of space for yourself, you set the stage to heal yourself, as a spirit. Once you feel that ownership, create a golden sun, and bring your energy back from where you left it. Make the sun at least as big as your space, or even bigger. Bring the sun in, fill up your body and your aura. When you are ready, open your eyes, stretch, and enjoy the feeling of owning your space. Download the MP3 instructional package, with the Video and PDF, for Meditation Class Two. It is enhanced with sound therapy techniques to deepen your meditation experience.